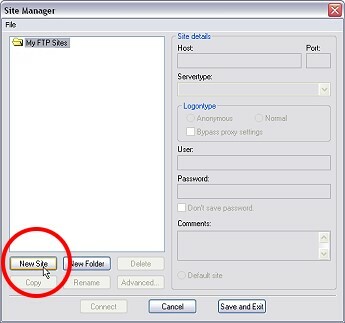 This tutorial is a basic step by step on how to add a new site to your FileZilla FTP program. Simply take your time and follow the instructions and you will be set up in no time. 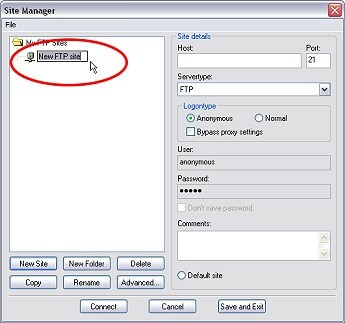 Open program and click on the top left "computer" icon as shown below to open up the Site Manager Window. Enter the name you want to label the site as. This step is not necessary but does come in handy and save time every time you reconnect to the domain. Click on the button to the right of the Default local directory and browse to the folder you have set up for the site you are adding and select that folder. Then enter "/www/" in the Default Remote Directory if you are the root user. If you are not the root user leave this field blank. Then hit ok. Note that some servers to require "passive mode" or "active mode". All of Digital Eagles servers are usable with just the default transfer mode. At this point you can do two things. You can "Save and Exit" or if you want to connect right now you can hit on connect and it will save and exit and connect to the domains FTP. 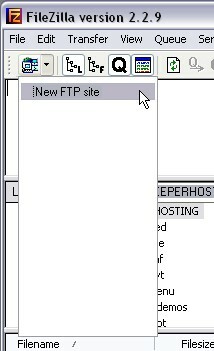 If you clicked on save and exit and now want to connect or if you just want to know the fast way to reconnect to your FTP after your first time this step is for you. Next to the little computer icon is a drop down error. 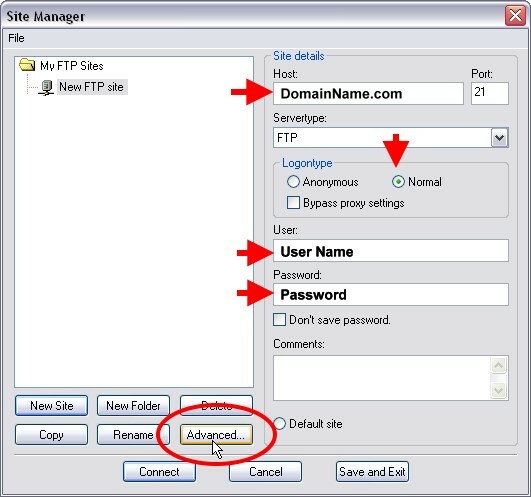 Simply click on that down error select your site and double click to connect to the selected domains FTP.